Here are a few bayonets attached to their respective rifles. The Mosin-Nagant bayonet will not fit properly and I have not worked on it to make it fit so the position you see is obviously incorrect since the shank obscures the front sight. Interestingly, most of the photos of Soviet troops in action show the bayonet affixed to the rifle. My understanding is the troops were ordered to put them on and keep them on unless told otherwise. So, bottom to top, we have the M-1 carbine with a Mk 4 bayonet. This bayonet, while it is marked on the guard as a Mk 4, has the solid grip of a German-made Mk 7, and there are no cross screws. That could be why it does not fit the carbine very well. Most WWII carbines did not have provision for bayonet attachment. The M-1 Garand is equipped with a 10 inch bayonet as opposed to the cut down 1905 variety. Next is post-war Enfield No. 4 Mk 2 with a the bowie style bayonet used until the No. 4 was discontinued around 1955. Just below is a WWII K 98 bayonet. I could not find my WWII vintage spike bayonet for the No. 4 but it is around here somewhere. Finally, the Mod. 1891 Mosin with bayonet and a Australian SMLE with the 1907 bayonet made by Wilkinson. Lin, you have an 1891/30 bayonet attached to an 1891 Mosin-Nagant rifle. Maybe that's the problem. Could be. It fits to a point and then will not go any further. The rifle dates from 1926. Thanks for letting me know. The bayonet was found in a shed at a rifle range with a note that said, "Somebody take this. I do not need it". So I took it. Interesting! Dad wasn't sure of the rifle it was for. I have been searching for an original WW1 era M95 bayonet for some time now. I have a Steyr dated 1917 and I would like to add a proper bayonet. I currently have it displayed with a rare ersatz bayonet made for the rifle. Hi Paul. Luckily the M95 is one of the most common bayonets and it's easy to come by. At $70-80 you can get a decent one. I recommend you to buy one made by OEWG (Steyr). They supposed to be interchangable between different makers, but I ofen hear collectors arguing about that. Some hungarian made ones seem to not fit well on austrian rifles and vice-versa. There were a dozen "third party" makers aswell, but cca. 90% of the Mannlicher bayonets were made by OEWG and FGGY. You can tell an early WWI model from the small rounded rivets holding the crossguard and unit markings, but you have to be experienced. Later produced ones tend to have bigger rivets with slightly flattened heads. Can you please post some pictures about your ersats bayonet? Thank you for the reply. I am holding out for a OEWG made bayonet, just trying to find a unit marked one, these are harder to find here in the US. I will try to get some photos this weekend of my bayonets, I mostly have WW1 era bayonets. My only bayonet is this M1905 bayonet, issued for the M1903 Springfield. It was made in 1911 by Rock Island Arsenal, and originally had a 16" blade. In 1943 it was cut down to a 10" blade by the US Army, to be reissued for the M1 Garand. The bayonet was then redesignated "M1". 3. Greek Mannlicher-Schoenauer, also known as Mod. Y1903. Some I-net sources (for example - www.edgedweapons.nl) insist that this type of bayonet is modified shortened Greek Gras M1874 T-shaped blade, but actually modified Gras bayonet looks very different. The M-S bayonet, shown here is the original Austro-Hungarian Stayr-made. 1. 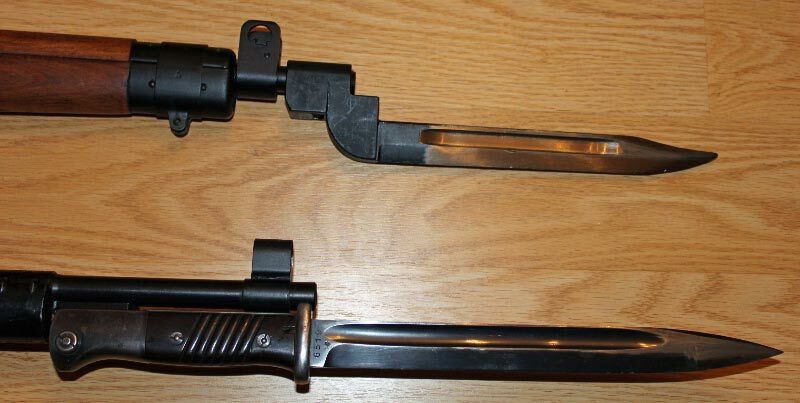 Bulgarian knife-bayonet for AK47. The grease on the blade is the manufacture's conservation. 2left. 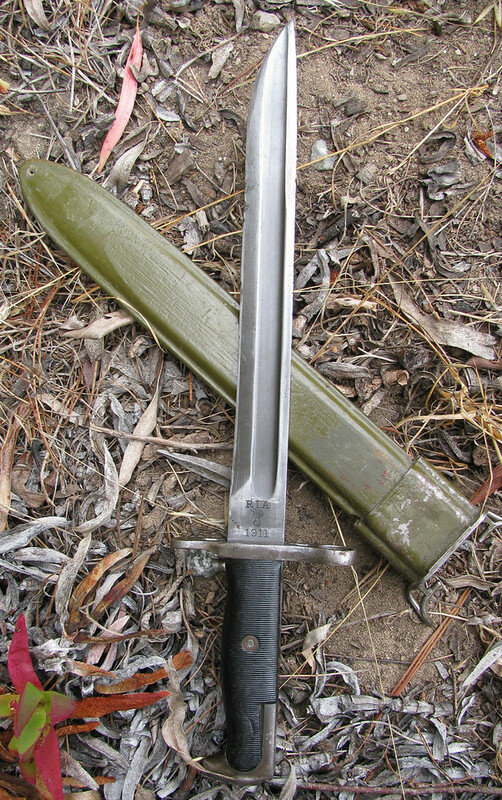 Russian (or more correctly - Soviet) AKM Type II bayonet. This one in made in Tula by TOZ (the stamp is triangle with an arrow in it). The blade is locked to the scabbard into the wire-cutting position. 3. 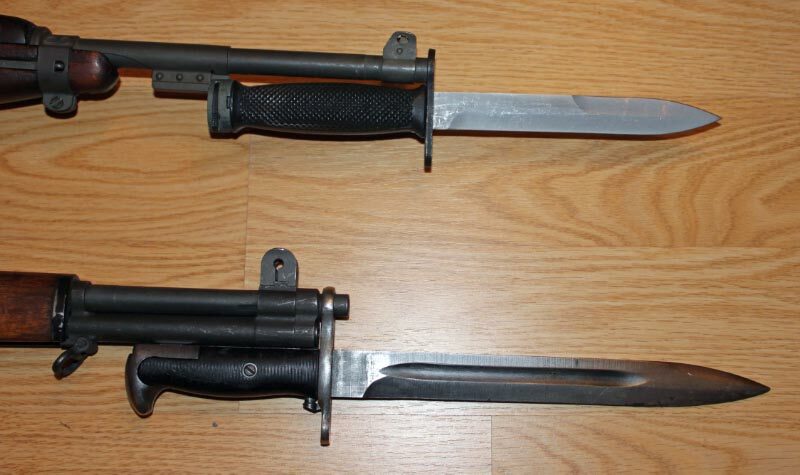 Czechoslovakian VZ-58 bayonet of late-production variant (with full-length tang). This one is with nickel-plated blade. 1. American for Henri-Martini (or Peabody-Martini) rifle, produced in the U.S. for the Turkish government. 2. Soviet for Mosin-Nagant 1891/30. 3. (not shown - it isn't at home right now) for M1867 Russian Krnka breachloading service rifle. Poor pic, but you get the picture. I have been collecting since 2010. I like to hold them in my hands and wonder who carried them, where have they been, what have they seen. It is the closest we will ever get to 'being there'. As a new member and to get the ball rolling here in the bayonets "show-and-tell" section, here's one of my favorites from my collection: Hungarian Model 1935 (for rifle of the same name and for the M1943 and Királyi machine gun also) for enlistedmen with sight (mistakenly called "cavalry" version...in fact the sight was placed to compensate for recoil on previous models!). Nice to meet you again George I really envy you for that beautiful M35. THX...you just can't avoid me!! !